The 1912 strike in the textile mills in Lawrence, Massachusetts, known as the Bread and Roses strike, was one of the most important industrial struggles of the 20th century. Conditions in the huge industrial sweatshops and surrounding tenements were so horrific that one in three workers died of malnutrition or disease before the age of 25. Child labour was also a normal part of the capitalist labour process, with children toiling alongside their mothers in workplaces largely made up of young female migrants from more than fifty countries. Yet amidst all this hardship and adversity, the strikers went beyond merely economic demands for ‘Bread’, famously calling for ‘Roses’ too – or a life worth living, beyond the bare subsistence grudgingly conceded by capitalism. Although conditions in Western countries at least might seem very different today, in fact the strike retains a huge relevance. Pay rates had been continually cut to increase the mill owners’ profits, with workers exhorted to “do more for less” and just like today the bosses sought to exploit ethnic distinctions to divide the workforce. US-born, English-speaking workers were given the most skilled positions, while more recent, non-English-speaking migrants laboured in the least skilled and lowest paid jobs, earning less than $9 for a 56-hour week. The trade union bureaucracy reinforced this situation by refusing to organise the most insecure workers – just as in Ireland today they have presided over the casualisation of vast swathes of the workforce and the hiring of new staff on dramatically worse pay and conditions, including slave labour “internships”. The spark that set off the strike was the mill owners’ decision to cut wages in response to a statutory reduction in the working week from 56 to 54 hours. Polish women weavers in one mill immediately walked out shouting “short pay, short pay!” Within a week, over 20,000 workers had joined them, transforming the once subdued city of Lawrence into a cauldron of class conflict and a potentially revolutionary situation. 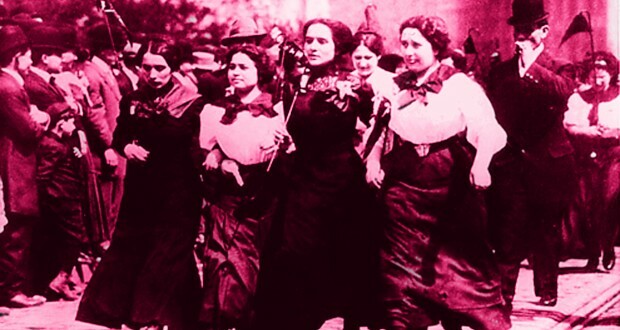 For two months, the women workers of Lawrence and organisers from the Industrial Workers of the World (IWW), pioneered important techniques of industrial struggle still in use today – such as moving pickets to circumvent anti-loitering laws, intimidation of scabs and strike funds financed through appeals for solidarity from workers across the country. The IWW and other socialist activists also quickly set up democratic strike committees with representatives from each ethnic group demanded a 15% pay increase, overtime pay, and no discrimination against strikers. This democratic grassroots organising circumvented the trade union bureaucrats’ attempts to collaborate with the employers and break the strike. The capitalist class responded with brutal repression. Police militias patrolled the streets, arresting strikers en masse on trumped up charges and hauling them before judges, who obliged with draconian sentences. 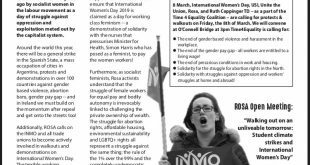 Despite all this, the strikers triumphed; winning nearly all their demands, triggering a wave of pay increases across the state and inspiring generations of women workers facing similar obstacles with a model of successful struggle.